Pawsense is a software program that can save your computer from your cat’s evil plot to destroy your computer. Pawsense detects and blocks cat typing and, also when it senses that a cat is on the keyboard, Pawsense makes a sound that will annoy the cat (a harmonica sound, a hissing sound or you can even record a sound that you think will deter your cat — maybe a dog barking? ), so the cat will leave the keyboard. Pawsense currently works only on Windows. Stop your cat’s plan to conquer the world. We know it’s happened to many readers. I’d buy stock in this company if I could. This entry was posted on Monday, May 21st, 2007 at 12:00 pm	and is filed under Cats, National Dog, Cat & Pet Info, Products & Services for Cats & Dogs. You can follow any responses to this entry through the RSS 2.0 feed. Both comments and pings are currently closed. How the heck do you always manage to find such a perfect picture to go with a belly laugh post??? I had to wait a while before I could type just looking at this one! 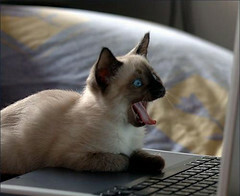 You know, I think the cat is just reacting to the Friday night recalls! 20. Can’t stick their heads out of Windows ‘95. 15. Fire hydrant icon is very frustrating. 14. Involuntary tail wagging is dead giveaway they’re browsing www . pethouse.com instead of working.